Never Drop Your Drying Towel Again! When drying a car, it's easy to allow the edges of your towel to trail along the ground, particularly when removing moisture from lower down areas such as sills and door shuts. 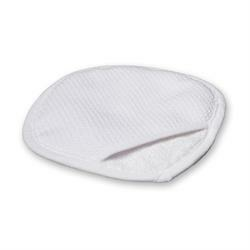 Microfiber Madness presents the solution in the form of a highly absorbent, double-sided drying mitt. The Drying Diamond features two different drying materials: on one side you'll find the crazily deep soft pile material of the Dry Me Crazy towel. The other side features the waffle-weave pattern of the Waverider. So, whether you're wiping or patting dry, you have the perfect solution! The interior of the mitt has two loops for you to slip your thumb and little finger into, the better to help secure the mitt to your hand. Have used this company a few times and each time all items arrived quickly and had been well packed.